The first edition of "Take On Me" comes in a silver and white sleeve. The front features a black and white group-shot with Magne, Pål and Morten (seen from the left to the right). 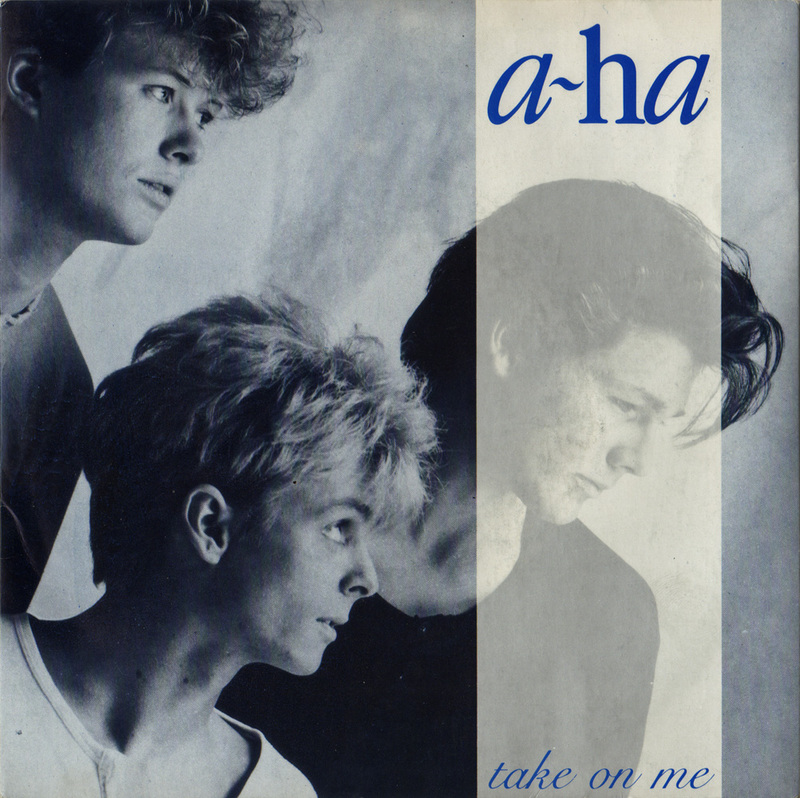 The a-ha logo is printed in a deep blue colour in the upper right hand corner, while "take on me" is written in the same colour in the lower right corner. The flip which is all silver features 3 individual shots of Magne, Pål and Morten seen from the top to the bottom left side. 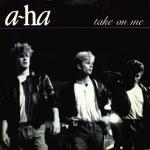 Titles "take on me" and "and you tell me" are written in black. This single was only released in Europe and flopped everywhere except from in Norway where it peaked at no. 3. The record is quite rare and features the original (3:10) and quite different version of the song produced by Tony Mansfield and remixed by John Ratcliff with a-ha. The B-side is "And You Tell Me" (1:48). As with most releases, there exist mispressings of the 7" release, such as one which has the same "Take On Me" disc sticker on both sides of the disc and one which has a regular "Take On Me" label on the a-side and a white WEA label on the b-side which is missing the titles. Promotional copies which just include a promo "Lizard Approved + tel. number" sticker on the cover also exist. The 12"-record is identical to the 7"-release except for the additional information concerning the tracks. 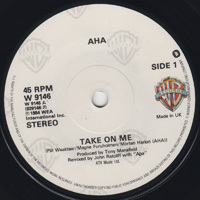 On the front sleeve "Long Version" is printed in silver under the title and on the reverse, the tracks are listed as "Take On Me" (long version) (3:44) and "Stop! And Make Your Mind Up" (2:57). Neither of these two tracks can be found anywhere else, a fact which explains the high collector value. 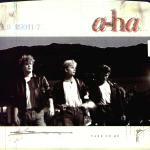 While the former track was produced by Tony Mansfield and remixed by John Ratcliff, the latter was produced by a-ha with John Ratcliff. Even though the song was accompanied by a unique video (not the cartoon) a picture disc was never released. An even rarer promotional edition of the 12" comes with a fold out poster (24"x24") featuring a shot of the band (Pål, Morten and Mags) where Morten has his arms around the other two. The a-ha logo is printed in white in the top right hand corner. The promo 7" comes in the same sleeve as the regular release, but has "Disco Promocional Prohibida Su Venta" printed on the label. It seems that the Spanish 12" release fails to include the "Demo Version" of "And You Tell Me", even though this track is listed on the record sleeve! - Information to be confirmed. 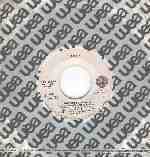 The 7" of the first release of Take On Me was also available in New Zealand. It doesn't have a pictures sleeve, but comes in a blue and white wea sleeve. The promo edition has a promo sticker on the label with the text "Demonstration record. Not available for sale... ". The second edition of "Take On Me" features a black and white group-shot (Magne, Pål and Morten) by Just Loomis. 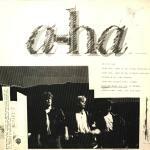 The a-ha-logo plus the song-title are both written in white and are placed in the upper left and upper right corners respectively. The reverse contains another black and white group-shot with a woman thrown in for good measure (Morten, mysterious woman, Magne and Pål). The background is white and all information is printed in black. This version of "Take On Me" (3:46) produced by Alan Tarney was the one that eventually caught on. A real collector's item is the 7" one-sided acetate test pressing which features only the album version of "Take On Me". It comes in a plain sleeve and the vinyl features a silver label without any titles. Again, there exists promotional copies of the 7" which feature the "Lizard" promo sticker on the cover. The picture sleeve of the 12" edition is identical to the 7" release except for the additional information on the other tracks on the front and reverse. It is worth noticing that there are slight variations in the shades of dark colour of both the 7" and 12" ranging from the spined pitch black Spanish 12" sleeve to the dark navy blue of the thinner UK and Australian editions. 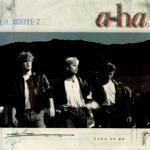 The 12" release features an extended version of "Take On Me" (4:41) that was also produced by Alan Tarney. In addition the tracks present on the 7" are included. Although the second edition of "Take On Me" is in increasing demand, it is both easier to get hold of and a lot cheaper than the first release. 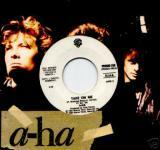 Promo 7" without picture sleeve which has Take On Me by a-ha on one side and a track by Prince on the other. No further details. The 7" and 12"-releases are identical to the U.S. releases (see below). There is a promo 12" which comes in a yellow WEA sleeve. It features the extended version of "Take On Me" (side 2, track 2). The disc label claims that "The Sun Always Shines On TV" is the second track on side 2, but this is incorrect. There is also a Brazilian 12" promo which features the track "Take On Me" by a-ha (track 2 on side 2), plus 3 other tracks by various artists. 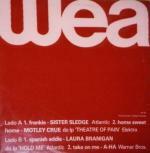 It comes in a dark red sleeve with the WEA logo in large white letters at the top and track listing in white at the bottom. The Canadian 7" comes in a white paper WEA company sleeve. The 7" doesn't come with a picture sleeve. The 7" has a picture insert similar to the USA sleeve (see below), but with red and black Japanese writing across the top of the front and whiter in colour. 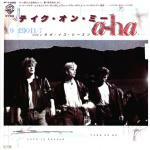 The reverse has the lyrics for "Take On Me", a different a-ha picture and additional Japanese text in black. There are two different WEA 12" promo releases. One features the album version of "Take On Me", the other features the extended version. Both vinyls include other artists besides a-ha. The 7" comes in a white and grey wea sleeve. The titles are written in Spanish as "Tomane" and "El amor es razon". There is also a rare Mexican 12" which comes in a unique sleeve. The front of the sleeve is white with a thick black border around the edge. 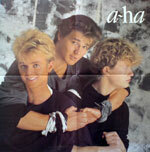 A band shot (Morten, Mags, Pål) with a red a-ha logo and white "hunting high and low" text at the bottom has been rotated and printed at an angle so that the top left corner is disappearing off the side of the sleeve. A thick black 'shadow' has been placed along the bottom and right hand sides of the picture. In the top right hand corner "Tomame" has been printed in red with "Take On Me" in blue underneath and "remix" in red underneath that. The reverse of the sleeve features the same picture (but full length) which has been printed on the left hand side, but not rotated. The right hand side of the sleeve is black with track details in red and white font. In addition, the "Hunting High And Low" album sleeve has been printed at the bottom of the picture. 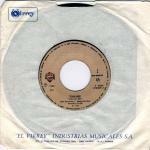 On the disc label, the track has been labeled as "Take On Me / Tomame"
The Peru 7" comes in a white paper sleeve with the text "EL VIRREY" INDUSTRIAS MUSICALES S.A. and an address printed in blue along the bottom. The disc label is light brown with the tracks written as "Tomame" and "El Amor Es La Razon" with the English titles in smaller letters underneath. The promo copy comes in paper sleeve and has the same catalogue number. The label is paler in colour and has the WEA logo and "Disco De Promocion Prohibida Su Venta" printed at the top. The 7" comes in a white company sleeve. The label is beige with black text. There are two slightly different versions, one has a darker label than the other. There is a unique 12" promo which comes in a picture sleeve. The cover is black and red in colour with a unique band shot in the centre (Morten, Pål, Mags). The picture has been placed over the top of a mauve irregular shape which resembles a piece of torn paper. A red a-ha logo is placed in the top right hand corner with the title in white in the bottom left. The reverse of the sleeve is grey and light blue, again with a torn paper affect where the two colours meet. 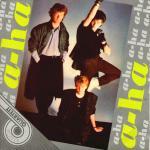 A large 'etched' a-ha logo (similar to that used on the front of the U.S. 12" promo) is positioned at the top of the sleeve. In the bottom section is additional text plus a small black and white picture of the band (Morten, På, Mags). This Philippines promo 12" can also be found in a "12" Disco Single" sleeve which has a picture of a 12" vinyl on a white background with "12" Disco Single" printed in blue, white and yellow at the top. The record label can be seen through the cut out in the centre. The 7" has the same sleeve as USA release (see below), the only difference in the back of the sleeve is the track listing as it has b-side "And You Tell Me" (printed as "Andy You Tell Me") instead of "Love Is Reason". This record features the original version of "Take On Me" on it's A-side. The 7" has the same sleeve as the USA release (see below). Other copies can be found in a blue, red and white WEA paper sleeve. The 7" has the same sleeve as the USA release (see below). The promo edition has the same sleeve as the regular release, but has "Disco Promocional Prohibida Su Venta" printed on the label. The first edition of "Take On Me" released in the States features a sleeve different from the regular UK release. The black and white group-shot is identical, but has been reduced in size and placed on a white background. A red and black a-ha-logo is printed in the upper right corner while the catalogue number is listed in the upper left corner. There are also some 'black crayon' scribbles and blue lines drawn haphazardly on the front and back of the sleeve. Finally the title has been written in very small letters in the lower right corner of the sleeve. The reverse features a reduced size group-shot with the names of the guys written underneath it, while only "Take On Me" is listed as a track. The catalogue number is printed in red in the lower right corner. The U.S. promotional copy has the same track on both sides but otherwise the picture sleeve is identical to its regular counterpart. The 12" - release has the same sleeve as the U.S. 7" [Item to be confirmed]. The 12" promo comes in a special custom sleeve which is mostly white with the same black and white group-shot placed in the bottom half of the sleeve, a large grey a-ha-logo in the top half and some black smudged `scribbles' lower down. The reverse of the picture sleeve is plain white. Playing at 33 1/3 RPM, the record has the extended version on side a, while the flip presents the single version. The third release of "Take On Me" in Europe featured the same tracks as the second edition. However, the picture sleeve had undergone some serious changes and now showed a multicolour group-shot (Morten, Pål and Magne) by Robert Erdmann. 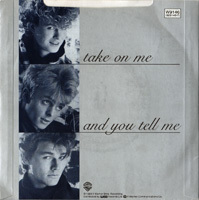 A red logo is placed on a grey background in the upper left corner, while "Take On Me" is written in small letters to the upper right. In addition a blue crayon-like line has been drawn underlining the song title. The reverse features an excerpt of Morten from the cartoon-video to the left, while there are six additional small prints from the video to the right (illustrations by Michael Patterson / Candace Reckinger). The tracks have been listed in yellow letters, and once again someone has been using the crayon, drawing a red line under the track listing. The label colours of the 7"-singles vary from the usual white label to blue, silver or copper plastic label. There is a limited edition available with identical front and reverse picture sleeve, only that this sleeve folds out and reveals a fact-file with vital information and individual pictures of Pål, Morten and Magne, four thin pages with excerpts from the video plus another colour band-shot (Morten, Magne and Pål) . The 12" release is identical to its 7" counterpart, but naturally features the additional information on the different track listing. On this occasion no picture disc was released, nor do we find evidence of any limited poster-editions. The Brazilian 12" promo sampler "Best of the Past - Vol. III" was released in 1993. It features the Alan Tarney version of "Take On Me" plus tracks by other artists. The 12" comes in a colour picture sleeve with a drawing of the band (Pål, Morten, Mags) by a Brazilian artist. The title "Best of the Past" is printed inside a large dark star in the bottom left hand corner. A picture of the band Chicago is in the bottom right hand corner of the sleeve. The reverse features adverts for the other two Volumes which also feature a-ha songs (Crying in the Rain and ?) plus drawings of the band and other artists. The sleeve of the French 12" is glossy and laminated but is otherwise identical to the UK release. There is a 12" promo "Fusion 808" released in 2002 by Dropout which features two remixes of "Take On Me": "Derler & Klitzing Mix" (7:59) and "Reeloop Mix" (8:35) plus the "Kaylab Mix" (7:33) of "Traveller" by Oliver Klitzing. The sleeve is grey with the Dropout logo in large black letters across the middle. There is a yellow rectangle in the top right hand corner with the following text in white: "FUSION 808 Take On Me Traveller Incl. : Derler & Klitzing Mix + Reloop Mix + Kaylab Mix DROP 0229-6". The record label is white with black titles. Following the immense success of the third release of "Take On Me" the G.D.R. came up with a 7" EP. This unique edition features a group-shot (Magne, Morten and Pål (sitting)). The background is a dark shade of grey, while a-ha-logos have been scattered to both the left and right of the picture. Two yellow or light green larger logos stand out, while a lot of smaller logos are printed in a light grey colour. In the lower left corner the logo of the record label Amiga Quartett has been printed. The reverse is plain grey with information on the track listings written in black. The label of the actual record is bright blue and all information is naturally written in German. There is a mis-press which has the same "a-side" label on both sides of the disc, although the actual disc has been pressed correctly. 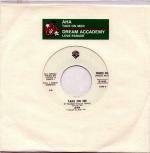 There is an Italian Juke Box promo 7" which features Dream Accademy - Love Parade on Side 1 and a-ha - Take On Me (3:46) on Side 2. The 7" comes in a white sleeve with a dark green sticker at the top which mentions both artists (including the spelling mistake - AHA TAKE ON MER). On the label is the text "Ediz. Speciale Per Juxe Box". There is another Italian Juke Box promo 7" ("Festivalbar") which comes in a sleeve similar to the regular release of "The Sun Always Shines On T.V.". The title hasn't been printed on the front sleeve and a large hole has been punched through the centre so that the record label can be seen. No further details. There is also an Italian DJ 12" promo of "Take On Me" which has the 12" version on side A and "The Love Parade" (6:14) by The Dream Academy on side B. This promo only 3" CD was given away free at "7-Eleven" stores in Japan (date of release unknown). 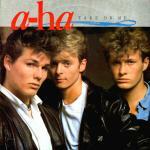 The CD comes in a 3" bright blue card wallet sleeve with "a-ha" and "Take On Me" printed in white letters at the top. Below this text is a picture of the "Hunting High And Low" album. The text "Presented by 7-Eleven" is printed in the bottom left hand corner and "Warner Music Japan" in the bottom right hand corner. The lyrics are printed on the back of the sleeve with some additional Japanese text along the bottom. The disc is blue with silver text. 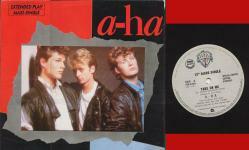 a-ha and the title are printed at the top of the disc with the text "Relax with a beer and a great song to see how wonderful life can be." and "Presented by 7-Eleven" at the bottom of the disc. The CD was made in Taiwan. 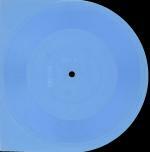 A light blue transparent 7" flexi disc featuring the tracks "Take On Me" and "I Dream Myself Alive" came 'free' with the Russian music magazine "Krugozor" (issue no. 7) in July 1987. The disc was one of six free flexi discs to come with the magazine. The two a-ha tracks are together on one side of one of the discs with two tracks by the artist Veneta Rangelova on the other side. One half of the disc is square shaped so that it could be attached to the centre of the magazine. The disc plays at 33 r.p.m. and is plain except some Russian text close to the centre which reads: "KRUGOZOR 33 TRIO "A-HA" Veneta Rangelova 11-12 7", but there is no track listing. 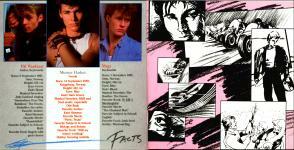 Pages 11-12 in the magazine give details of the artists featured on the disc, a-ha are on the last page. There isn't a catalogue number, only a number (70461 ISSN 0130-2698) which seems to be the serial no of the magazine. The cartoon sleeve 7" is released in America as a promo only and with the same sleeve except for the words "Promotional use only not for sale" printed inside the back cover. Some copies of this promo went out with a letter from Warner to the people who helped with a-ha's video and single thanking them for their support. Spain Take On Me / Love Is Reason 929011-7?